Having been traded to an entirely new division in the offseason, Yasiel Puig needed to find a new rival to brawl with now that the trips to San Francisco would be far and few between. Luckily for him, the Pittsburgh Pirates gave him an excuse on Sunday to throw hands against what seemed like the entire roster. The brawl kicked off in the top of the fourth when Pirates pitcher Chris Archer intentionally threw behind Cincinnati’s Derek Dietrich. Dietrich’s crime? Staring at a home run he hit in the top of the second a little too long for Archer’s liking. Rather than using the experience to realize he should throw fewer bad pitches, Archer retaliated the only way an overly sensitive pitcher knew how and forced both benches to clear. The first person out was Reds manager David Bell, who really got into the home plate umpire’s face about the incident. Then Puig came out with a righteous vengeance and furious anger. He went straight for Archer and had to be held back by a couple teammates. Melky Cabrera soon intervened, along with Puig’s teammate Joey Votto, in an attempt to calm Puig down. That worked for all of 30 seconds before Puig escaped and tried to charge at Archer, leading to another scrum between both benches. 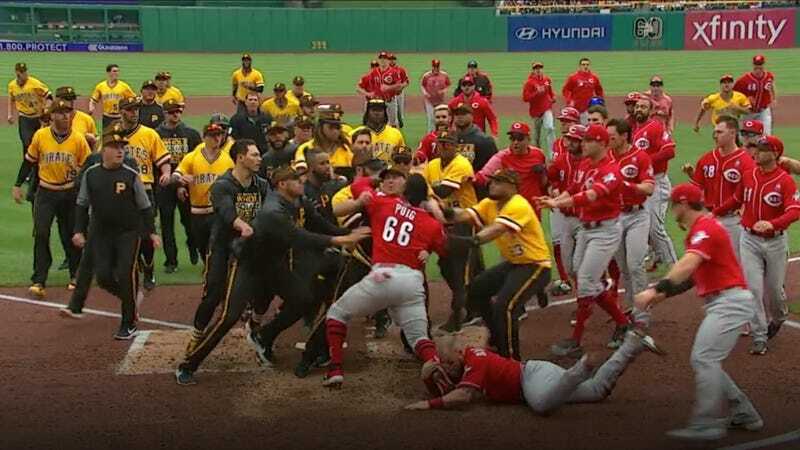 As the broadcasters speculated, Puig’s decision to charge at the crowd of Pirates a second time after he was held back will probably result in some sort of punishment. But who could honestly blame him? It’s probably a lot easier to challenge players when they look like they’ve just come out of a pack of 1965 baseball cards.